After an extremely exciting week of tagging and releasing turtles. 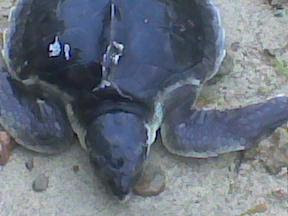 Our first rehabilitation sea turtle candidate of 2010 has arrived. Some of our followers may remember last year's first arrival: Acadia. But, weighing in at a whopping 1.2 kg (2.64 lbs) this turtle is a little easier to handle. 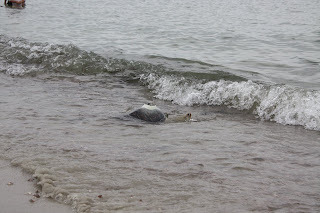 The turtle was reported to us by a beachgoer on Martha's Vineyard that stated it also had damage to it's shell. 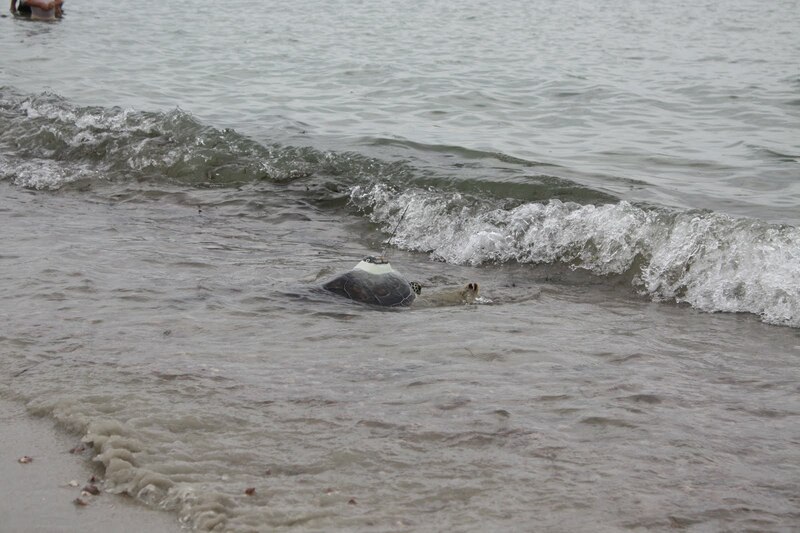 Our first thoughts were "Hope it isn't one of our released turtles..."
Once we received the cell phone photo (above). We knew it was a sea turtle. Look at that shell and that dark color. Definitely a Kemp's ridley! 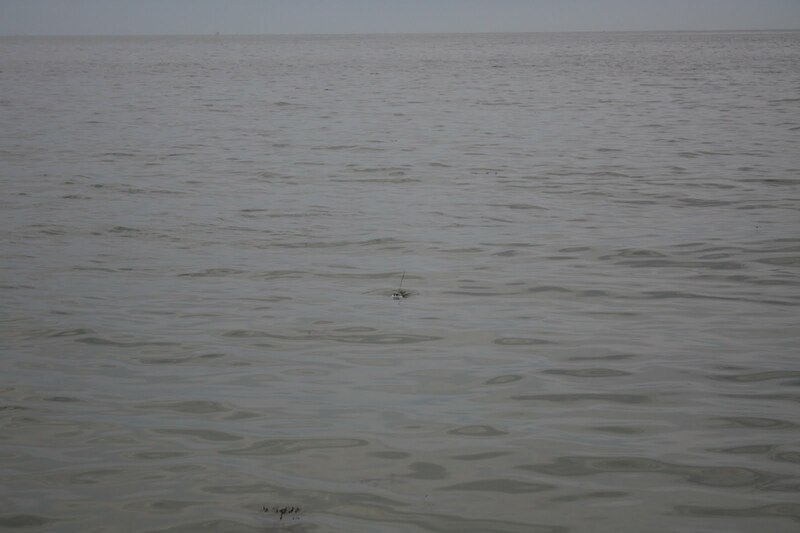 Definitely not one of our released turtles! We confirmed that there was indeed a crack on its first vertebral scute as seen in the photo below. It could have been from a boat. Given the tiny size of the turtle it definitely would not be easily noticed in the water. A team headed down to the ferry terminal at Woods Hole and performed diagnostics on the turtle as we headed back to the Aquarium. The blood values looked good overall. 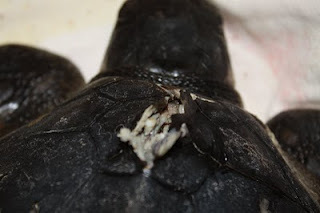 Besides the obvious shell fracture the animal was a little thin and did not open its eyes. Connie and Ulrika start the debriding care of the newest patient. We got the new patient back to the Aquarium fairly late and started debriding and cleaning the fractured area (as seen above). After cleaning and applying an antibacterial cream to the area the turtle was tucked away for the night. As of this morning the turtle is still a bit lethargic. But still has a strong heartbeat. I put it in a kiddie pool for a quick swim and it took a while to get going, but then started using both front flippers and swam all around. The turtle was buoyant and did not use its rear flippers during the ten minute swim but I am confident this little guy (or gal) should do well. TURTLE MAP - HOT OFF THE PRESS! 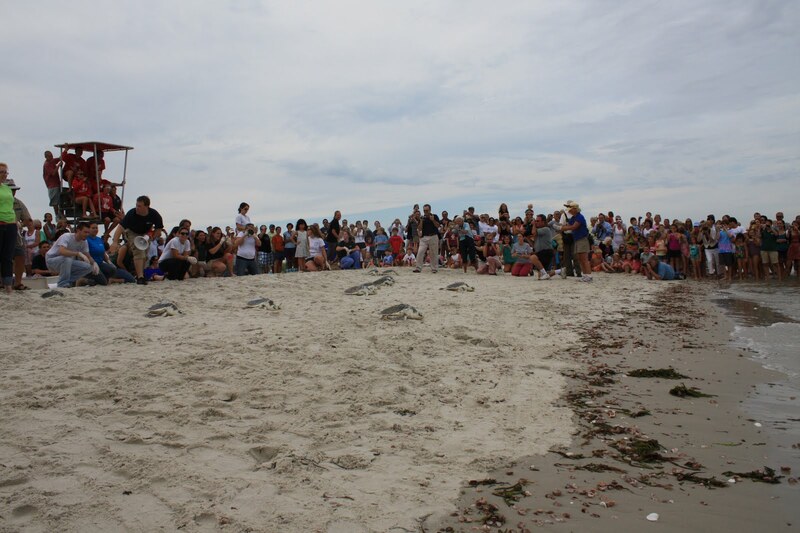 As you have seen from Kerry's last few posts here and here, the 2010 sea turtle release was a spectacular event! A few hundred lucky beach goers looked on as the turtles were removed from their boxes and placed on the sand for release. 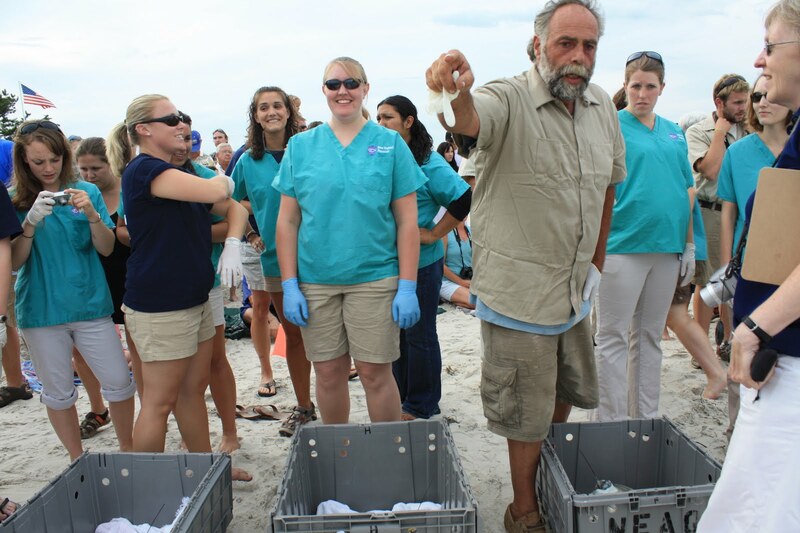 A total of 18 endangered animals were released back to the big blue during this event. 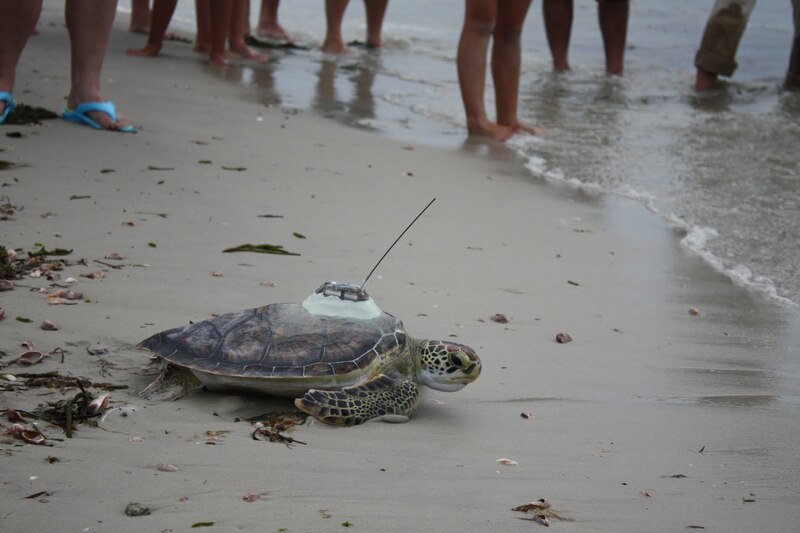 Four of these turtles were outfitted with Wildlife Computers SPLASH satellite telemetry tags. These tags will collect information including location, dive depth and time at depth data. 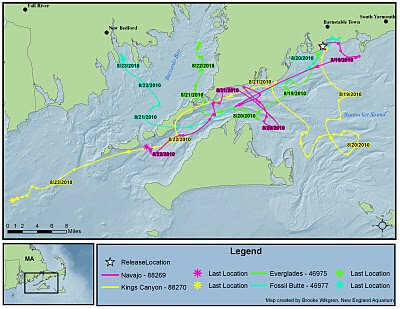 The data is transmitted from the tag to an Argos satellite and then to my computer. I log on every morning at 5:00 a.m. to check the turtles. 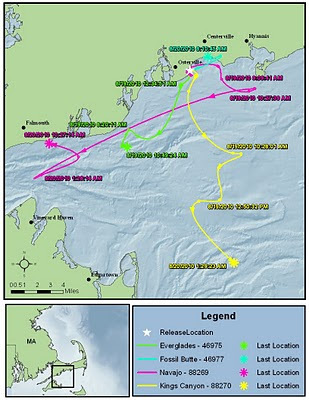 Usually I breath a huge sigh of relief when I see that all the tags are still transmitting and that the turtles appear to be doing well re-entering their habitat. Below is a new map of the data transmitted today - it's hot off the press so enjoy! These turtle tracks can also be monitored on a daily basis and or adopted on seaturtle.org by clicking here. 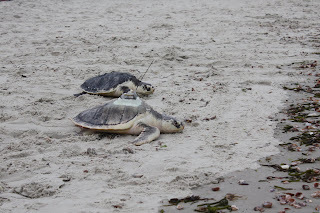 Yesterday I mentioned that 4 of our sea turtles were satellite tagged for the release. 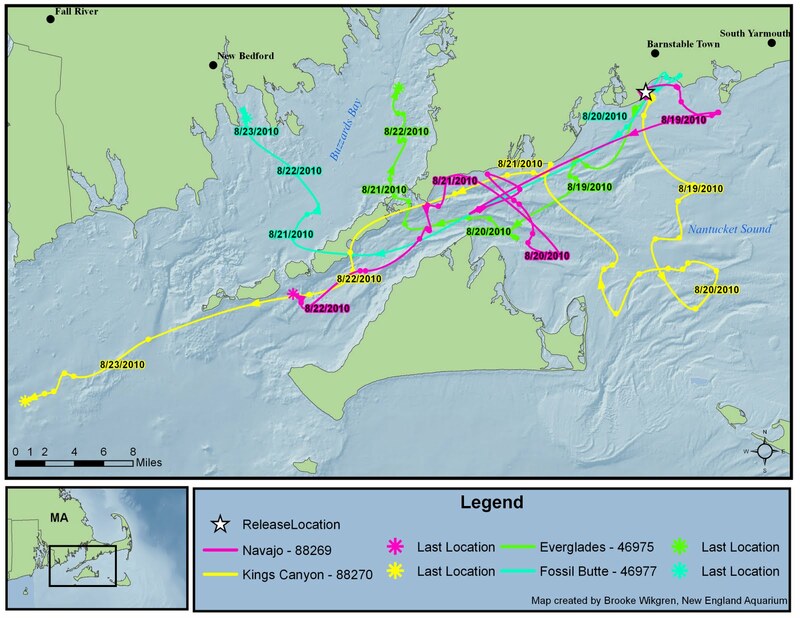 See the map below, created by our GIS expert Brooke Wikgren, to see where they have gone already. 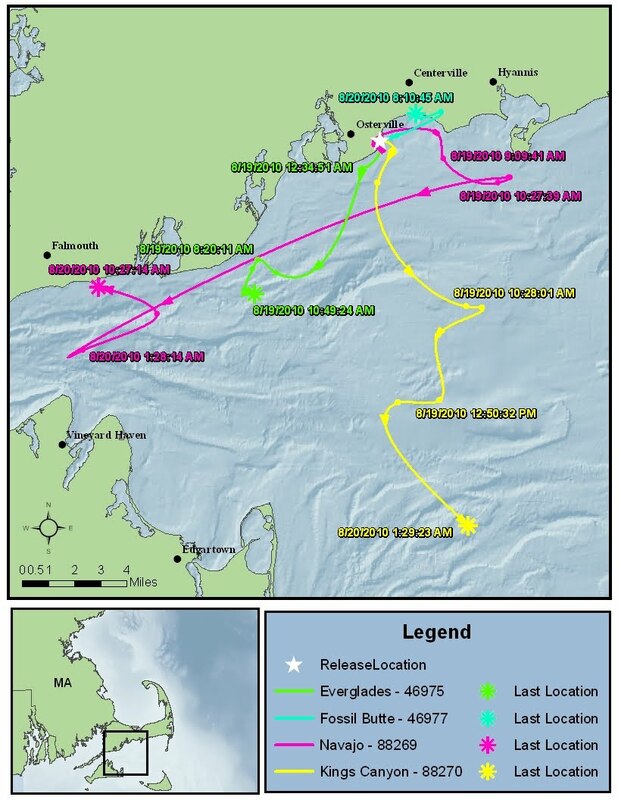 It should be interesting to see if they follow the same path as Goose, a green sea turtle released last year. You can visit seaturtle.org to track and adopt these turtles. 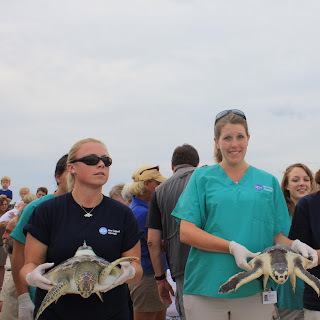 I would also like to thank all our volunteers, interns, and staff from our rescue team, Mass Audubon and UNE who have helped this sea turtle season. 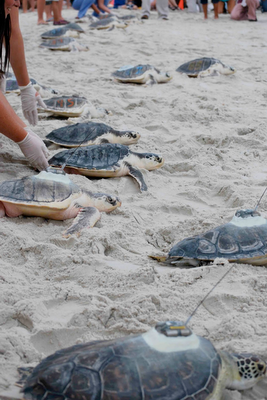 Without you, we would not be able to successfully release these animals. 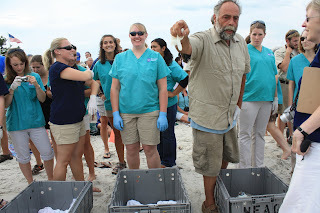 Enjoy the pictures below of volunteers and staff from all organizations at the release! 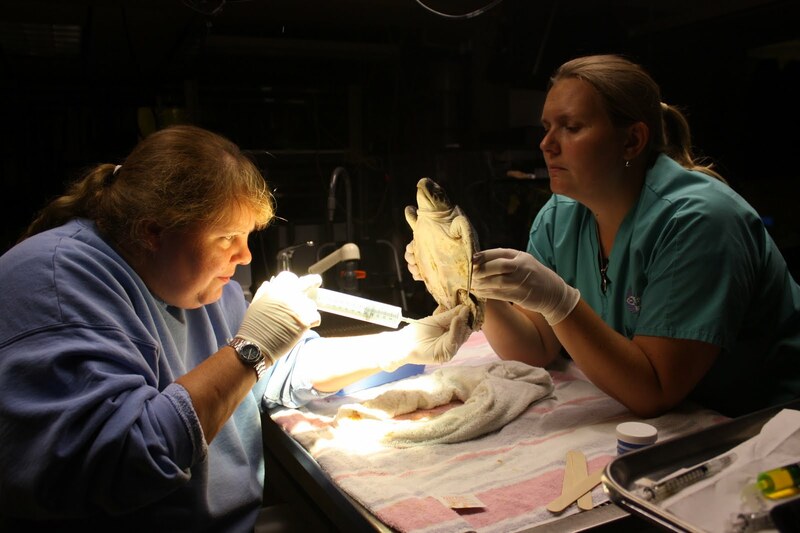 The above picture on the left is NEAQ veterinarian Dr. Cavin at the center with Dennis from Mass Audubon next to her. The picture on the right shows UNE volunteers and staff preparing to release the turtles. The picture on the left shows Erin (on left), a rescue staff member, and Randi, one of our dedicated volunteers. The picture in the center is Katie, the veterinary technician for NEAq, ready to release Tuzigoot. On the right is Adam announcing instructions to the turtle handlers. The picture on the left is of the Rescue Team's "Tuesday Crew," (left to right: volunteers Alison, John, Emily, and staff Ulrika). 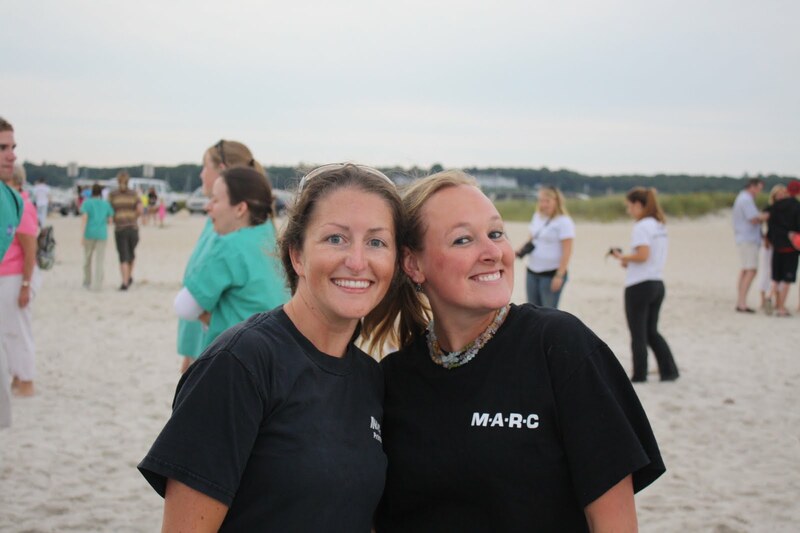 The picture on the right shows UNE staff members Shannon and Asheley celebrating after the release. Thank you again to everyone for their support and hard work! 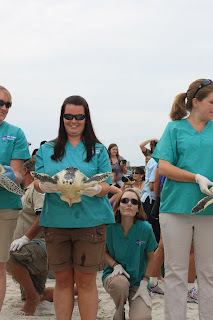 Yesterday was an extremely exciting day for the Rescue Team and our sea turtle patients! Six of our sea turtles (3 Kemp's ridley sea turtles and 3 green sea turtles) returned to the ocean on a beach on the south side of Cape Cod. We were joined by our sea turtle partners at Mass Audubon and the University of New England's Marine Animal Rehabilitation Center (UNE). 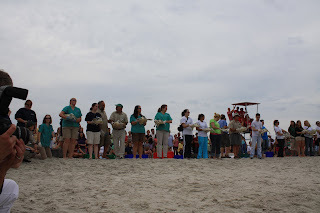 UNE brought 12 of their own rehabilitated Kemp's ridley sea turtles making this one of our biggest release events. 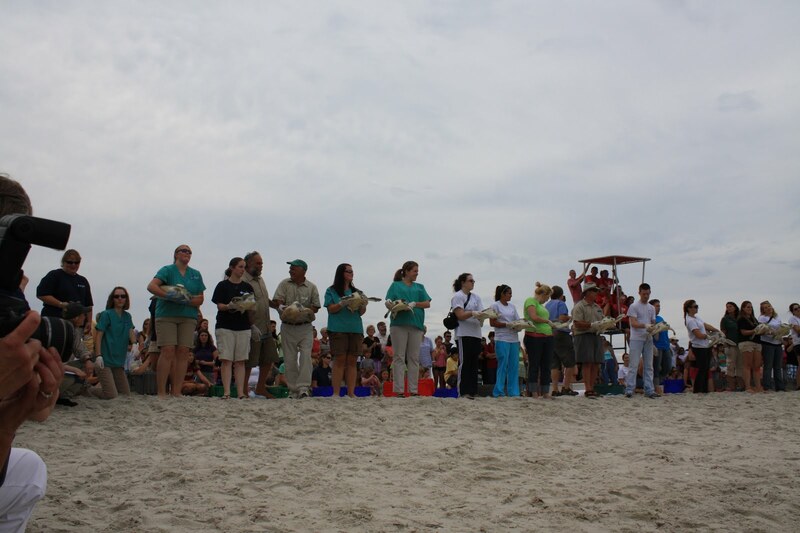 After a short walk around the crowd, the turtle handlers lined up on the beach. And then the turtles took off down the beach and into the water! The picture on the left shows Tuzigoot (foreground) making his way towards the water. Tuzigoot was one of our most critical patients at one point. The picture on the right shows Kings Canyon, a Kemp's ridley turtle, with a satellite tag on his shell. #22, Navajo, was a little slower than the others and needed a some help along the way. We placed satellite tags on 3 green sea turtles and 1 Kemp's ridley. It is already exciting to see the transmissions. 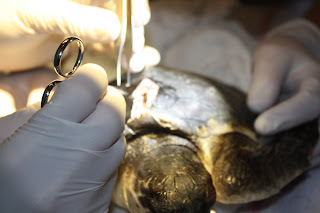 Visit seaturtle.org to track and adopt Navajo, Everglades, Fossil Butte and Kings Canyon! #83, Fossil Butte, enters the water. NECN was there to capture in the event. 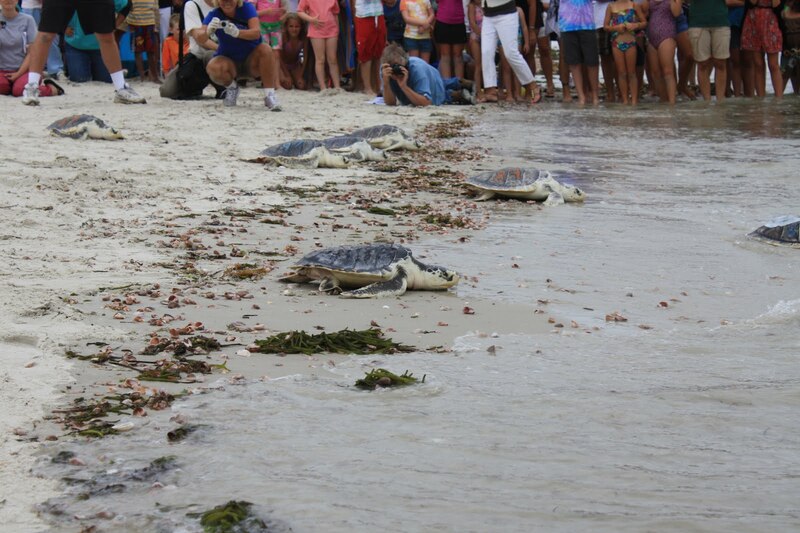 And take a look at this video to see what the turtles did after entering the water. 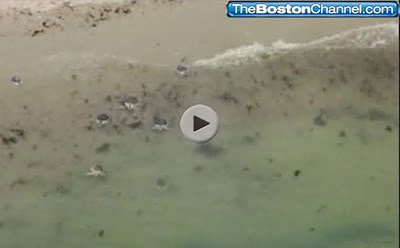 Amazing footage from WCVB Channel 5! It's difficult to describe what it takes to arrive at release day. 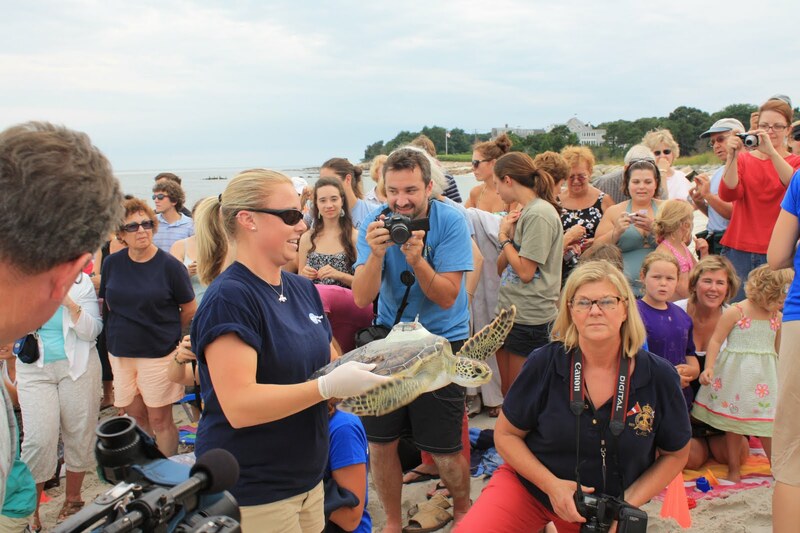 First, without the teamwork, dedication and expertise of the staff and volunteers at Mass Audubon, the New England Aquarium and the University of New England, saving these endangered species would not be possible. 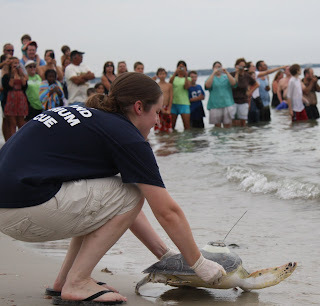 Rescue efforts involve an army of beach walkers, turtle drivers, biologists, veterinarians, veterinary technicians and countless volunteers. We thank each and everyone involved in these efforts for their part in working to save a species. Candi in the turtle house! First, I should explain the title of this blog. 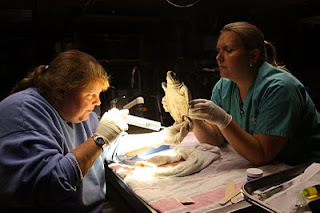 As our faithful readers will remember, while Dr. Innis and I were in New Orleans caring for oiled sea turtles from the Gulf oil spill, the days were very long and hot. On most days our busy turtle treatment schedule did not leave time for a lunch break. Candi, one of our dedicated blog readers, shipped three cases (yes three cases, not bags) of Dancing Deer cookies down to the turtle teams. On many a long day these fine treats became lunch and/or dinner. The cookies were welcomed and enjoyed by everyone working at the facility! Upon returning from my sea turtle shift in the Gulf I posted a note in hopes that Candi, our generous cookie provider, would see it. I asked her to email me personally and invited her for a special behind-the-scenes tour of the Aquarium Medical Center and our Sea Turtle Clinic here at the New England Aquarium. 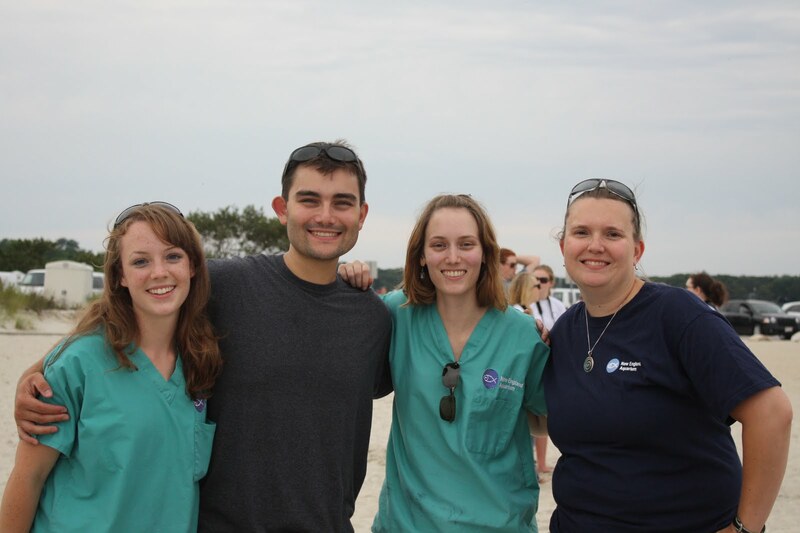 In the photo below Candi (far right) and Adam talk and laugh during our tour of the Sea Turtle Clinic. 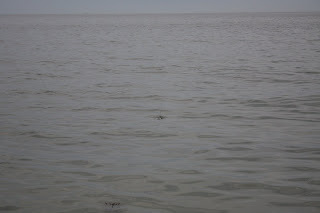 During our visit, I tried to take a few photos of the green sea turtles but they kept swimming toward me. These are not my best photos but they look pretty interesting! I think the turtles took a shine to Candi, they kept coming back to the side of the tank to check us out. In the photo below Candi and Adam watch our intern, Allison, feed the green sea turtles in the tank. We had such a nice visit. When Candi arrived she brought me another gift, a copy of a painting she had done of one of the turtles I posted on the blog from New Orleans. The painting is amazing and has earned a place on the wall in my office! [You can see the painting on the Aquarium's facebook page.] Candi is a special kind of person. We all knew it from the thoughtful gift she sent us. Her kind gesture touched us all and made us more aware that people out there knew what we were doing. For Candi and all the others who have responded to our blogs, please know we greatly appreciated your support. It truly felt like we had a giant cheerleading squad all our own. Thanks Candi, it was great fun meeting you!